This map was published in Amsterdam after the great fire of 1666. The title appears along the top of the manuscript, with the key to parish churches (in scrolls) at top left and top right, and dividers at top right. 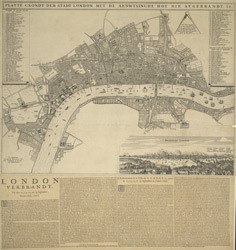 An engraving of the great fire is inset at bottom right, entitled "BRANDENT LONDON". Below the plan, the fire is described in Dutch and French.